Whether you own a daycare center or you're simply a parent looking for childcare for your child, a sample daycare menu may provide some general yet useful information. The website for the United States Department of Agriculture (USDA) offers numerous links which provide information on meal planning for childcare workers. Here you can find sample daycare menus, regulations and policies for the Food and Nutrition Service division of the USDA, and other information. 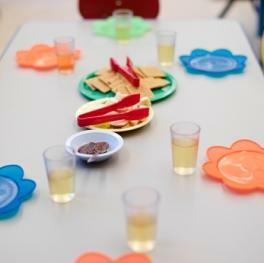 The Child and Adult Care Food Program also offers detailed menus for infants to adults, and these menus are designed to meet the USDA requirements as well. Strive for nutritional balance as you create a menu. Create tasty food combinations by mixing spicy foods with mild-flavored foods. Mix higher fat foods with lower fat foods to achieve balance as well. Create variety by alternating familiar foods with new foods. Contrast foods that feature a variety of textures and flavors. Choose food color combinations carefully as well. For example, mix bright and dull-colored foods together to make the meal more visually appealing. Don't overlook regional or cultural food preferences when choosing foods to add to the menu. Purchase seasonal fruits and vegetables whenever possible, as these may be more economical and fresher. Portion sizes should meet the needs of the children to be served. The key to creating a successful daycare menu centers around cooking healthy meals that children will want to eat. State and local nutritional requirements should be considered as well. However, daycares don't necessarily have to limit their menus only to the minimum requirements. While sugary, salty, and fried foods are typically avoided, other foods may be added. For example, many breakfast nutritional guidelines do not require that schools serve meat as part of a breakfast menu. That doesn't mean, however, that schools must refrain from adding bacon or sausage as long as these foods still follow nutritional guidelines. Fresh fruits and vegetables are certainly preferred, but canned fruits and vegetables are usually accepted as well. Milk servings are typically 1% or 2% low fat choices, but for children less than two years old, whole milk is generally preferred. The following is a sample daycare menu that can be used or modified to meet the lunch needs of a daycare or childcare facility. Finally, for more information and guidelines relating to daycare menus, read the USDA's page entitled, Team Nutrition.